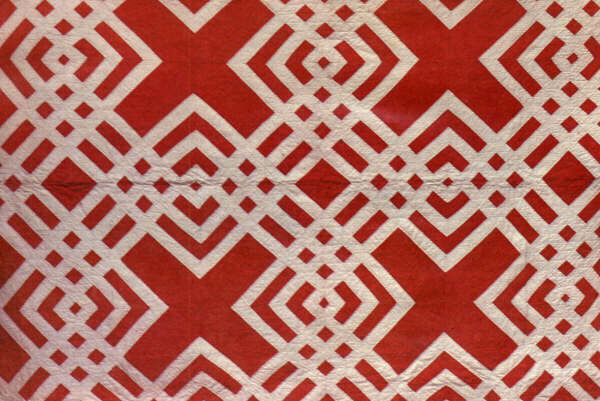 This bold red and white psychodelic-looking photo was discarded from our choices of quilts for the Fall 1976 front cover of Bittersweet. The staff said it looked too modern, for they wanted one that represented the old fashioned quilts made years ago. Much to our surprise we found out that this Carpenter's Square quilt was pieced in the 1860's. It looked modern because of the bold striking colors and the almost three dimensional design effect which made it look like abstract art. 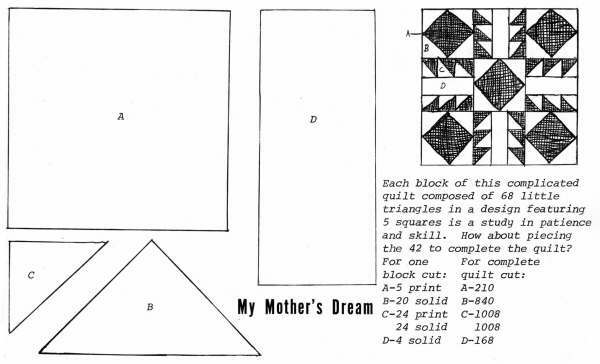 The quilt maker was not an artist and did not think of herself as an artist. 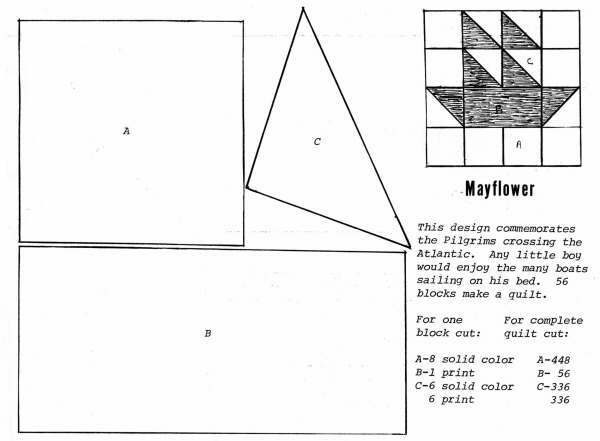 The Carpenter's Square quilt is made of nine big blocks of many shaped pieces. 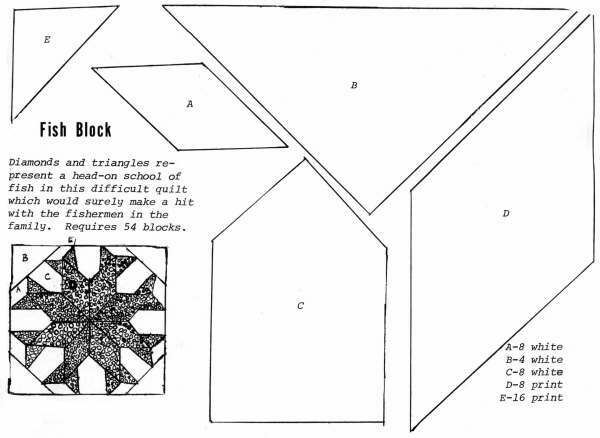 (pattern illustration below)1.Piece together pieces for triangle I. Begin with piece A, add B,C,D,E,F and G keeping straight edge even. 2.Sew strip H on to triangle I. 3.Piece together strip II using 1 piece i, 4 red J's, 6 white J's and 2 E's. 4.Sew on to strip H. Match red lines from triangle I. 6.Piece strip III as strip II only use C's instead of E's for end. 8.Piece strip IV using 1 M, 6 white i's and 4 red i's and 2 A 's. 9.Sew strip IV to strip L matching red blocks as before. 10.Repeat steps 1-7 for other half of block and sew halves together. 11.This is one block. The completed quilt will use 9 blocks, 3 each way. 12.Put on border as desired. Complete quilt takes approximately 3 yards of 36" material for each color. 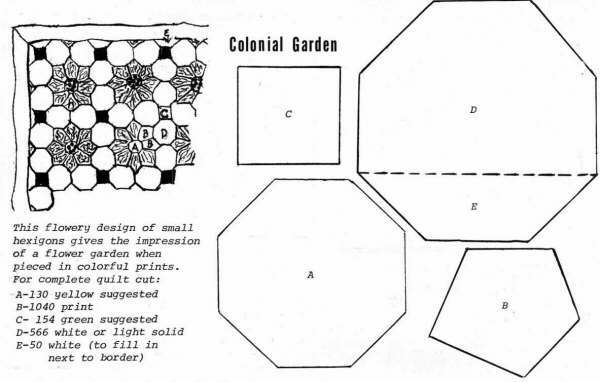 While making needed bedding for her family, she experimented with design possibilities creating patterns to suit her taste and moods. Like the modern abstract painter, she used color and geometric forms to represent objects (Fish Block quilt), movements (54-40 or Fight), ideas (Improved Nine Patch) and emotions (My Mother's Dreams). But unlike the painter, she used her imagination to create her designs with needle and thread and pieces from the scrap bag. Pieced quilt patterns were loaned and shared readily. 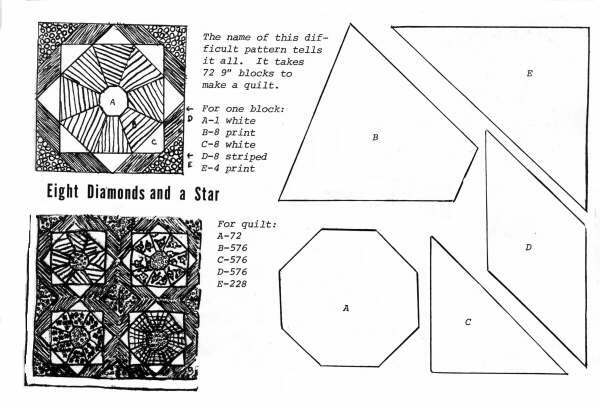 But even if five different women used the same basic pattern, none of the quilts would be alike because the makers might vary the size of the pattern by making it smaller or adding more pieces. 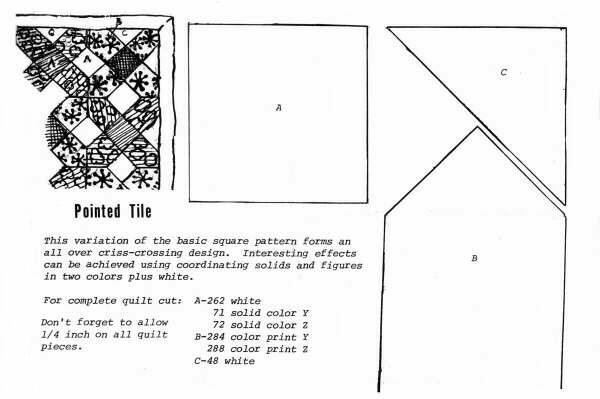 They would all have different color combinations and use different materials depending on what they had and, they would put on a variety of borders that would give each quilt a different captured effect. For those who enjoy creating quilt patterns there is no limit to the variety of designs available. But to make a quilt of real artistic merit requires not only imagination and an aesthetically pleasing artistic design, but also fine craftsmanship in the needlework. Add 1/4" seam allowance to each pattern piece on all patterns. Measurements for most patterns are for a quilt 6'x7'. What would be nicer than signatures of each loved one embroidered in a handmade quilt. This quilt takes 56 blocks. 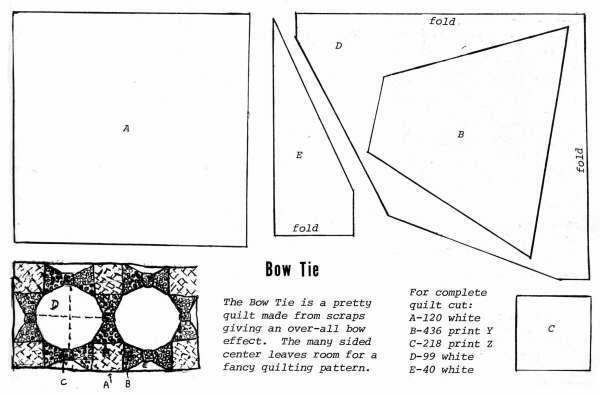 The Bow Tie is a pretty quilt made from scraps giving an over-all bow effect. The many sided center leaves room for a fancy quilting pattern. This variation of the basic square pattern forms an all over criss-crossing design. Interesting effects can be achieved using coordinating solids and figures in two colors plus white. 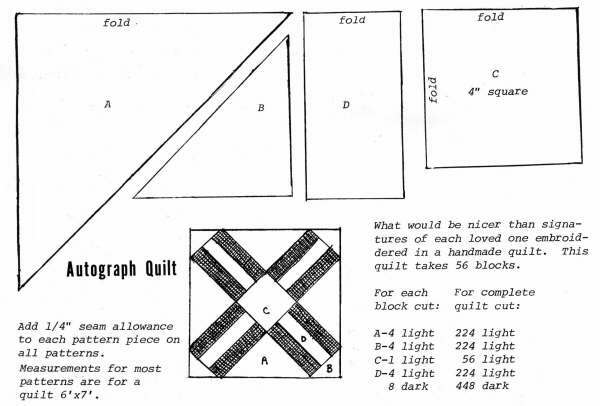 Don't forget to allow 1/4 inch on all quilt pieces. This flowery design of small hexigons gives the impression of a flower garden when pieced in colorful prints. This design commemorates the Pilgrims crossing the Atlantic. Any little boy would enjoy the many boats sailing on his bed. 56 blocks make a quilt. Each block of this complicated quilt composed of 68 little triangles in a design featuring 5 squares is a study in patience and skill. How about piecing the 42 to complete the quilt? Diamonds and triangles represent a head-on school of fish in this difficult quilt which would surely make a hit with the fishermen in the family. Requires 54 blocks. 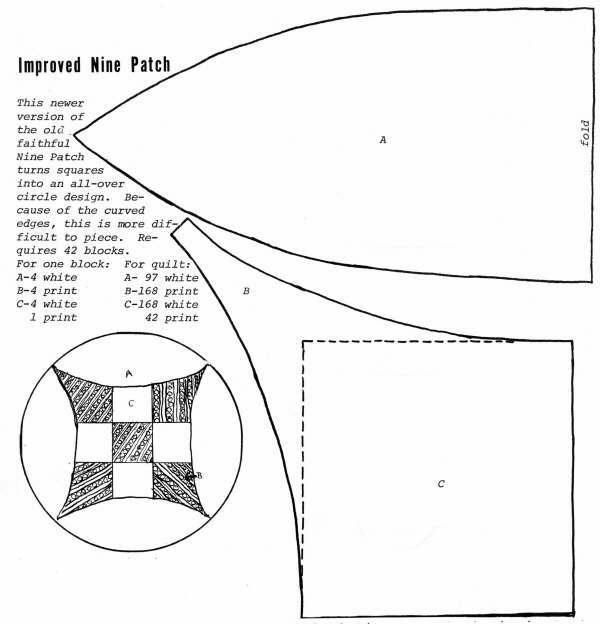 This newer version of the old faithful Nine Patch turns squares into an all-over circle design. Because of the curved edges, this is more difficult to piece. Requires 42 blocks. A hexigon and a square complete the patterns for this abstract design which would brighten even a Kansas Dugout. 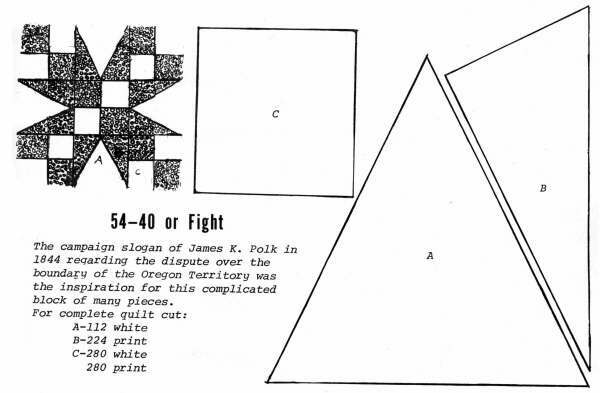 The campaign slogan of James K. Polk in 1844 regarding the dispute over the boundary of the Oregon Territory was the inspiration for this complicated block of many pieces. The name of this difficult Pattern tells it all. It takes 72 9" blocks to make a quilt.